If you’re searching for a clean, affordable urgent care in Greensboro, North Carolina—FastMed has a clinic nearby staffed with friendly medical professionals. Just put your zip-code into this convenient office finder and get the hours of operation, addresses and phone numbers of a FastMed in your neck of the woods. Greensboro, NC, is a wonderful place to call home. For starters, the city is based on the simple principles of honesty, integrity, stewardship, and respect. Perhaps these excellent principles come from Greensboro’s rich history, or maybe it’s more the people who help make it great. Either way, residents certainly do have a lot to smile about, including having access to the best clinic in Greensboro, NC FastMed Urgent Care. FastMed is a smart, affordable alternative to waiting for hours in the ER, and as a walk-in clinic, our medical professionals can see you the same day. In fact, we have a goal to get you the diagnosis and treatment options you need within one hour of coming to see us. In Greensboro, NC, there are actually two FastMed Urgent Care clinics, and there are several additional clinic locations in nearby cities. No matter where you are when you need quality medical services for non-life-threatening injuries and illnesses, FastMed has you covered. Our qualified, experienced medical professionals can provide a diagnosis and treatment options for everything from a sore throat to an ear infection to a sprained ankle. Even if you’re not sick or injured, you can count on the best clinic in Greensboro, NC, to provide prompt, personal medical care. We believe the best clinic in Greensboro, NC, should offer affordable, accessible health care, and that’s what we strive for. Our clinics are open 365 days a year, and services are provided at a fraction of the cost that you’d pay at your local ER. 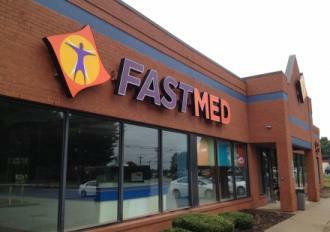 Find out more about FastMed Urgent Care through our FAQs page, and be sure to follow us on Facebook.